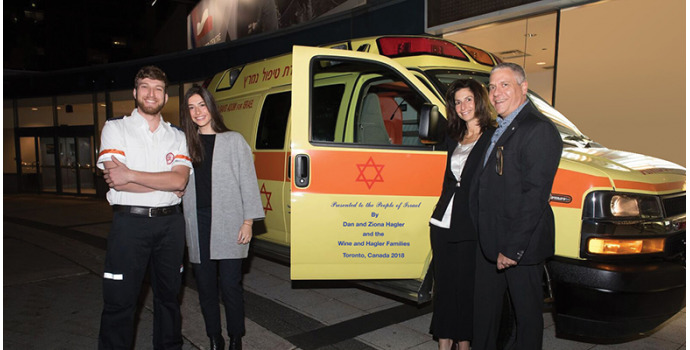 On Thursday, November 8th, the Toronto community came together to celebrate the great work being done by Canadian Magen David Adom. The Toronto Centre for the Arts was filled with a fantastic turnout of supporters who donate funds to ensure that Israel's paramedics have the supplies they need to accomplish their lifesaving work, and that Israel has the blood services it needs. There were many food stations in the theatre lobby so everyone could partake of savoury treats and talk with friends and family before the event. Once in the theatre, the crowd was welcomed by David Meyerowitz, President of the Central Region of CMDA. He spoke passionately about the mission of MDA and of our responsibility to assist them in every way we can. He outlined the history of MDA, that it was formed before the State of Israel was established, that most of the work is done by volunteers who give of their time and expertise whenever and wherever they are needed. He called on Tova Salomon, whose husband, Yosef Salomon, daughter Haya and son Elad, were murdered in a terrorist attack as they were sitting down to Shabbat dinner in Halamish on July 27, 2017. This courageous woman was critically injured in the attack and was saved by MDA. She spoke in Hebrew and CMDA paramedic, Itai Orion, interpreted her words, which deeply moved the audience. She demonstrated great courage and dignity in the face of unspeakable horror and spoke of the experience in detail. She praised CMDA for saving members of her family and thanked members of the community for supporting CMDA. After her remarkable presentation, the audience was treated to a world-class entertainer who put on a dazzling show. Oz Pearlman, a mentalist who has been seen on many TV programs and who has received great accolades from the New York Times, The Wall Street Journal and Forbes, among others, appeared to be reading peoples' minds. People chosen at random from the audience participated in his act and were as surprised as members of the audience at how he seemed to know what they were thinking. It was an unforgettable performance with a chorus of "How did he do that?" from everyone leaving the theatre. Following closing remarks, the audience made their way to the foyer where a delicious selection of kosher delights awaited them. Guests did not want to leave, staying to partake of the refreshments, talk with friends and speak to members of Magen David Adom who made themselves available to answer questions about their work in Israel. They also enjoyed the singer Avery Raquel whose talent enhanced the evening's feeling of warmth and good fellowship. The evening was another triumph for the Toronto Chapter of CMDA in consciousness-raising of the indispensable work of the magnificent paramedics and in raising funds for the organization. Toronto CMDA is dedicated to building on this considerable foundation to reach an ever wider audience, so that our partners in Israel have all they need to accomplish their mission. The week after the event, the brief but deadly exchange between the IDF and Hamas in Gaza demonstrated yet again the need for all the ambulances and equipment we can provide in order to save lives.